The Anime Archivist: Video Backlog: "Yawara!" Story Outline: Yawara Inokuma may seem like an ordinary girl, but since she was a toddler she has been trained to be a judo champion by her grandfather. Her grandfather, Jigoro, was a famous judo champion in his heyday, and works Yawara hard in order for her to win an Olympic gold medal and the prestigious National Merit Award, much to her annoyance. 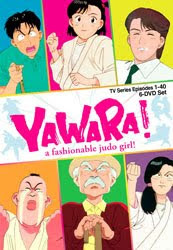 While Yawara tried to keep her judo practice a secret, she apprehends a purse snatcher and the event is captured by a small time sports newspaper journalist, Matsuda, and his photographer. Though Yawara’s face isn’t in shot in the picture in the newspaper, Jigoro is horrified as her wants his granddaughter to have a grand debut with a well-respected newspaper and other media. Regardless he continues on with his plan and sniffs out Sayaka Honami, a pampered princess who excels at all sports, to be Yawara’s rival. Things are complicated further with Sayaka’s judo coach, Kazamatsuri. Though brilliant at judo, he has stage fright. And he’s a ladies man and takes an immediate interest in Yawara, both at a professional and personal level, much to the disgust of the possessive Sayaka. Though Yawara plans to deliberately fail her first real judo match, she wins and is an overnight sensation with a lot of potential to live up to. But Yawara just wants to be a normal girl. Not only does she find herself seemingly forced into becoming a judo champion, she has two suitors fighting over her, Matsuda and Kazamatsuri. Mini Review: Those with long memories may recall the petition to get “Yawara!” on DVD in the early 00’s. Well in 2006 Animeigo announced they had the licence, but this set came out in 2008. And only in the last few months has Animeigo fessed up that there will be no more box sets coming supposedly due to a rights issue (but I’m sure the sets didn’t sell like hotcakes). Anyway there’s no chance we’ll see the remaining 84 episodes ever in English. Still, I’m amazed we got these 40. The Animeigo set is pretty amazing, especially when you consider it was made post US anime bubble. Apart from their almost overdone subtitles which included notes at appropriate times, we have an amazing 72 page booklet which tells you just about everything you need to know about the series and about judo. The slicks on the DVD cases actually make up a picture when you put them together; which is Jigaro throwing Yawara. The anime itself (maybe I should mention it, huh?) is very shoujo in appearance, even though I believe the original manga was published in a shonen magazine (the manga was by Naoki Urasawa who is more famous in the west for “Monster”, “20th Century Boys”, “Pluto” and even “Master Keaton” than this show). Yawara herself is probably one of the most likeable characters I have come across in a long time. But the real star of the show is Jigoro (as evidenced by the show’s eyecatches), but toward the end of the episodes in this set, he becomes a real tyrant, but he does redeem himself. For the most part the humour of this show does come from Jigoro. Towards the end of this set of episodes, Yawara moves from high school to college and the light hearted tone does change to a slightly more serious one. The judo battles become a bit more intense and so does Yawara’s love life. The addition of a ditzy photographer to put a spanner in the works of her relationship with Matsuda was bit ham-fisted I thought and there are some really silly unrealistic moments which don’t fit in with the story, however in the end I could mostly suspend disbelief. Also don’t let the judo aspect put you off. This isn’t really a sports anime. Surprisingly there’s very, very little in the way of actual judo in the anime. Yawara defeats most of her opponents in a few seconds and I can only recall one episode where a match went on for more than 10 minutes. Instead the focus here is on the development and relationships of the characters. The show has aged a bit, but it’s a lot better than the fansub I recall seeing some 12 or so years ago. I’ll give it a respectable 7.5 out of 10.